Medical tourism includes getting a Gastric Band abroad. Increasing numbers of clinics offer gastric band surgery, and increasingly the gastric sleeve and gastric bypass surgery. Now that these procedures are readily available, more and more potential patients are searching online for answers to questions relating to getting a gastric band abroad. We’re here to clear up a few of the common misconceptions and also let you know that there is another way to achieve incredible weight loss without going down the surgical route. This page was written by Martin and Marion Shirran. With over 10,000 hours of clinical treatment time at their clinic in Spain, exclusively helping people achieve permanent weight loss, they not only know what they are talking about, but they may also be able to help you achieve your dream without resorting to gastric band surgery abroad. Many people interested in the surgical weight loss option start by searching for either gastric band abroad, or gastric sleeve or bypass surgery, as they believe it to be a less expensive option than UK-based treatment. However, in many cases it does not end up that way. When looking for surgical options outside of the UK, a long list appears of what looks at first to be inexpensive deals each offering to fit your gastric band abroad in Europe and of course much further afield. We recently had a client visit us who had travelled all the way to India for the treatment, only to change her mind upon arrival, which obviously resulted in significant costs. 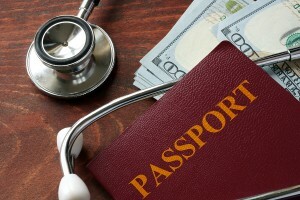 The obvious initial thoughts of those seeking the treatment abroad is that it is often less expensive, of course! But what if something should go wrong? What can you expect from post-op care? Will the clinic or indeed the surgeon still be in business in six or twelve months’ time? How qualified and experienced are the surgeons and the theatre team? Just how many gastric band procedures have they carried out? Would your insurance cover you if you were taken ill on the return flight? We’re not here to scare you, but these are just a few of the very important questions that everyone should consider when they are thinking about investing in gastric band surgery or weight loss procedures abroad. The NHS might be the first point of access to have your gastric band surgery, or sleeve or bypass. It’s normally favourable to travelling abroad for a gastric band, but for various reasons it’s not always possible to get a gastric band on the National Health Service. You may not have a sufficiently high BMI, or your local health authority may have particularly onerous criteria, or you may just want to speed things along instead of waiting at the end of a very long list. So you start looking into the prospect of having the operation to fit your gastric band elsewhere. But do take your time to consider all your options. The more time you invest in research at this stage the better. This is life changing stuff, and the procedure is not always reversible. For starters, you’re faced with searching through hundreds of different websites for a suitable clinic. And with fees well into the thousands of pounds, it’s not surprising that some people choose the often cheaper, overseas option. Google “gastric band abroad ” or “weight loss surgery abroad” and you’ll find these procedures available in Europe, Eastern Europe, India; there are so many potential destinations for people like you who are eager to take back control of their weight and change their lives for the better. Get your Gastric Mind Band abroad. Next, you’ll need to look into issues like transport, insurance, language, and accommodation…. And where your health is involved, you really should ask all the right questions, not just some of them. You’ll not only need to look into your surgeon’s qualifications, but you’ll also need to find out straightaway if the hospital or clinic is recognised by the country’s health authorities. How many nights will you need to stay post-operation once your weight loss surgery has been completed, and where will you be staying? Will you have nursing care? How does the clinic deal with aftercare? Who covers the costs if complications occur during or immediately after the surgery, especially if you are not able to travel home after your gastric band abroad? Who will be there to help if something goes wrong? And crucially, with gastric band surgery, when where and by whom is the band filled – and at what cost, because there will be several sessions needed during the months following your procedure. One additional point to be aware of relates to your European travel insurance, Does your current policy cover you for this type of a trip? It would be worth obtaining a letter from your insurance company ahead of booking your surgery. Not only will this give you peace of mind, but it will also ensure there are no major financial issues during or after the procedure and the accompanying journeys. Opting for a UK-based clinic might deal with some of these concerns, but of course the cost, side effects and risks of surgery remain. Do ensure you are fully aware of the mortality rate associated with any and all forms of bariatric surgery before you give your clinic the go-ahead. It is a medical fact that obesity increases the mortality rate, regardless of the surgery being performed. What about the non-surgical alternative to getting weight loss surgery abroad, then? If you are seriously interested in taking control of your weight and you’re at the stage of considering going under the knife to get the desired result, then we urge you stop right here. Spend ten minutes investigating a surgery-free, zero risk option: the respected Gastric Mind Band treatment. There’s no surgery, no side effects, and the whole process is available at a fraction of the cost of surgery at just £1,495. The Gastric Mind Band programme has already completed by over a thousand clients at the Elite Clinic in Spain alone, and it’s a treatment that has been undertaken by both the general public and celebrities alike. Plus of course any follow-up assistance you need won’t be of the medical variety, so you’re eliminating post-treatment risks right away. Read the many case studies on this site. Take a look at the completely independent review of the treatment from Claudia Connell, the Features Editor at the Daily Mail. Absorb Sarah Vine’s piece in the Times. You have nothing to lose, and you’ll be astounded by the incredible results on offer from this alternative to getting gastric band surgery abroad! Sarah lost half her body weight with the GMB. The Gastric Mind Band procedure has attracted considerable media interest around the world: the therapy has become something of a phenomenon on both sides of the Atlantic, developing into the treatment of choice by members of the public and celebrities alike. The procedure is now the subject of the book, The Gastric Mind Band, published by Hay House. Gastric Mind Band clients benefit from the considerable research and development that went into the GMB method. The developers, and trademark owners, Martin and Marion Shirran, have now built up more than ten thousand one to one clinical hours, over the past ten years, working with people who fly to the clinic from around the world, each determined to achieve their ideal body weight. At the end of the GMB treatment, each client leaves the clinic with his or her own set of carefully prepared tools, most are completely unique to the GMB, including a very extensive manual, and a set of digitally produced copies of each session. At the Gastric Mind Band clinic located in Southern Spain, we are totally committed to client follow-up, and on-going research and development. We are proud that we offer the most thorough answer to those wanting to escape from the roller-coaster world of yo-yo dieting, in order to establish a permanent solution to their weight problems. Visit the Case Studies section of this web site, and check out the reviews from past clients. If you are still in any doubt, why not read the many independent reports and reviews featured on the Press page. If after reading the information on the website you decide to book your GMB treatment, the booking procedure could not be easier: simply contact us by phone or email us with details of your chosen dates. Once availability is confirmed, we will email you an online payment invoice for your deposit of £495, which can be paid by PayPal or credit card, enabling you to spread the cost.